The mental-health conditions and services in most African countries are of great concern. There is a stark distinction of health disparities between urban and rural communities across these countries. There is an unequal divide in the allocation of resources for health related services, and mental health services have become a political decision more than the fair distribution of resources. The situation is even worse in the less developed countries across the various sub-regions. People all over the African continent are increasingly being affected by many common psychological and mental health disorders, as well as illnesses that go untreated for many years. This book is based on the assumption that there is a need to examine the conditions/services of mental health prevailing in different African countries to inform and educate people about the situation, and also to serve as an additional source of knowledge on African mental health issues. The stigma of mental health is legion in sub-Saharan Africa in spite of several initiatives and interventions to reduce it. Mental patients are largely seen as a pariah who are subjected to all forms of acts regarded as dehumanizing. Family support which is a key social support for mental patients has waned as a result of negative socio-cultural practices and modernization. Furthermore, the issue of mental health does not feature prominently on the agenda of ministries of health on the continent leading to a shoe-string budget being allocated to mental health vis-à-vis programs and priorities of the ministries. There is total fatalism and inadequate interest in how to deal with the mental health conditions and services. This has also resulted in little research and publications on mental health. Even where there are some research and publications, they are scattered and sporadic. It is against this backdrop that the book under review on Mental Health Conditions and Services in Selected African Countries: Implications for Social Work and Human Services Professions should be viewed. Accordingly, the book should be considered a positive and welcome effort to move the issue of mental health from the back burner to the front burner. 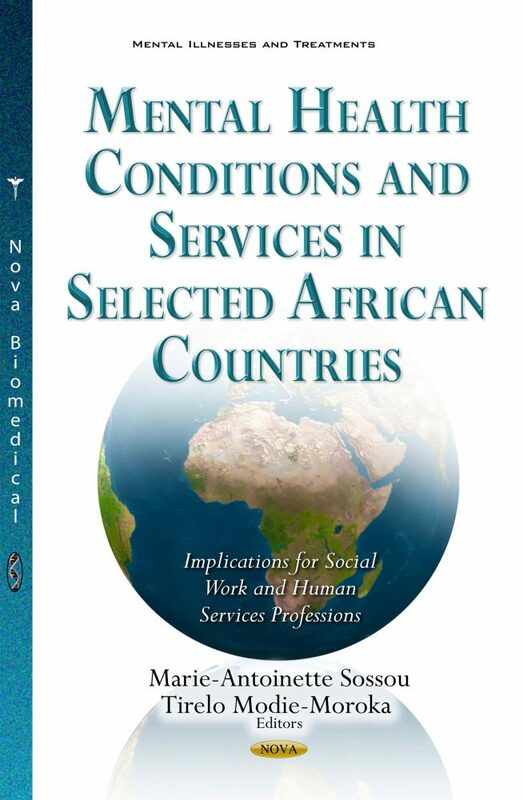 According to the editors, the main objective of the book is to “capture the different mental health services into one centralized book for dissemination among social work and other human services professionals to enhance their understanding, information and education about the conditions of mental health diseases and the lack of effective social welfare programs and treatment services for this vulnerable population across the continent” (p. xiv). In other words, the book is to provide a one-stop shop on mental health services that will enable social work and other human services professionals to engage in scholarly debates and thereby appreciate both retrospectively and prospectively issues, challenges and remedies on the subject matter of mental health. The book contains an introduction and eleven chapters covering eight sub-Saharan African countries, namely, Botswana, Kenya, Rwanda, Ghana, Nigeria, South Africa, Uganda and Zambia. The introduction is devoted to a discussion of the state-of-the art on mental health in Africa and the role of social work in mental health as well as the pulling together of the eleven chapters into a single perspective. Of the eleven chapters, two chapters each are devoted to Botswana, Kenya and Rwanda unlike Ghana, Nigeria, South Africa, Uganda and Zambia, which have a chapter each. One would have expected that the editors indicate why they had devoted two chapters each to Botswana, Kenya and Rwanda and why they had chosen the eight Sub-Saharan African countries, which are all Anglophone with the exception of Rwanda which has two official languages, namely, French and English. It clear that the choice of countries was probably determined by availability of material in English, which is common to the eight countries. My reading of the two chapters each on Botswana, Kenya and Rwanda does not show any intra-country duplication or overlap. The strength of the chapters is that they have tended to show either the different nuances, angles or particular cases studies on mental health in the three countries. For instance, of the two chapters on Botswana, one of them is devoted to the historical evolution of mental health services while the second one is on mental health care, HIV and AIDS. Similarly, of the two chapters on Kenya, one of them is on mental disorders while the second one is on the delivery of mental health services. Equally, the two Rwandan chapters follow a similar pattern: one of the chapters is on mental health care in hospitals while the other one is on the 1994 genocide and its effects on children and psycho-social intervention. There are some positive things about the book which need to be flagged. First is the comparative element. The eleven chapters covering eight countries and dealing with key issues on causal factors, resource constraints, suggestions and recommendations for improving the conditions of mental health patients is in itself a commendable comparative academic exercise as it is easy for one to fully understand the trends in mental health in the eight countries without any difficulty. Second is the fact that most of the authors are social work researchers, practitioners and educators as well as psychologists who have first-hand knowledge and understanding of the issues and challenges confronting mental health in their countries. The mix of scholars has brought to bear on the book the proper balance between theoretical and practical issues of mental health and, more importantly, the affinity between Psychology and Social Work as disciplines. Moreover, of the eleven chapters, four of them (1, 4, 10 and 11) were sole-authored while the remaining seven were-co-authored with Chapter 5 having as many as seven co-authors. This multiple authorship (from several disciplines, namely, psychology, social work, communication, law, public health, etc.) and occupations have made the book more readable and practical and therefore relevant for both academics, practitioners and students in the field. Third, I found the conclusions and recommendations in the eleven chapters more relevant to policy than some of the publications with which I am conversant. Recommendations such as the roles and direction of social work education, research and practice, the call for advocacy as well as upholding the human rights of the mentally disabled persons are consistent with the literature. If there is any weakness in this book, it is that it has not got a conclusion to take the debate forward and also set an agenda for future research. The implications of the findings for the comparative, theoretical and empirical literature could have been explored if there were to be a conclusion. This is sometimes difficult, particularly, in an edited volume with uneven quality of chapters. All social work/ nursing, medical/ public health / social science students in Africa countries, and internationally, policy makers, social work practitioners and international social workers and NGOs.